TACUP/SWACUMS attendees tour Del Mar College's in-plant. 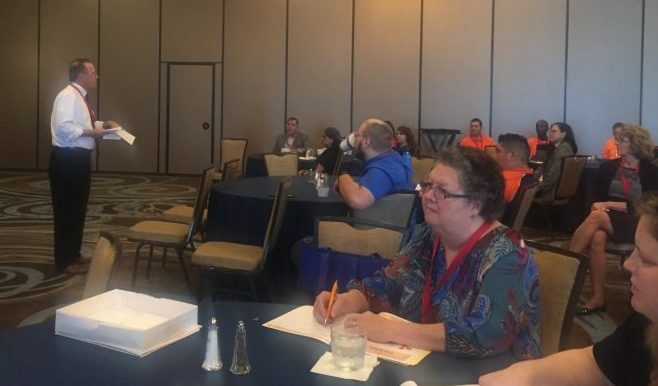 The Texas Association Of College And University Printers (TACUP) met in November in Corpus Christi, Texas, along with the Southwest Association of College & University Mail Services (SWACUMS). More than 35 in-plant print and mail managers attended the event. The University of Texas at Austin's Richard Beto discusses how his in-plant responded to bombings in the city. Local school Del Mar College played a big part in the conference. Professor of Communications Sarah L. Contreras gave the opening keynote titled "Seven Keys to Disney’s Success: A Guide to Better Customer Service." Chief of Security Lauren M. White gave a presentation on "Stress and Response to Critical Incidents." Also, PagePath's Adam Witek detailed how Del Mar College saves hours of time by using a Web-to-print system. Then later in the afternoon, attendees toured the college's in-plant. Other sessions covered mail visibility, budgeted hourly rates and the new USPS payment processing platform, Enterprise Payment System. One session detailed how The University of Texas at Austin responded to that city's recent spate of bombings. Another covered how the University of Houston Downtown dealt with the flooding in that city that swamped its in-plant. IPMA Executive Director Mike Loyd also addressed the group. The conference wrapped up with a tour of Texas A&M University's Mail Services and Print Shop. Attendees tour the in-plant at Del Mar College, in Corpus Christi.